At some point prior to the Alessian Slave Rebellion, a clan of Barsaebic Ayleids led by Myndhal invaded the region of Murkmire in southern Black Marsh in order to steal the souls of the native Argonians. The Ayleids launched a series of attacks on the Root-Whisper Tribe. Nevertheless, the tribe was unable to resist the invaders, forcing the tribe's Hist tree to take a drastic measure: the creation of a "seed", an amber gem which would later be known as the Remnant of Argon, which was capable of holding the souls of the tribe, preventing the Ayleids from harvesting them. In this way, the Hist planned to preserve its tribe and become dormant, only to be awakened when the Ayleid threat to Murkmire was ended. The location of the Remnant was ultimately lost to time, leaving the souls of the tribe trapped beneath their withered Hist tree, forgotten within the Deepmire. Both the local Hists and Argonians all intrinsically knew of the Remnant, though the only thing the Argonians could connect to it was the Hist's feeling of deep sadness. Both the location and true nature of the Remnant of Argon would not be discovered until someone who would be known as 'the Rootmender' came to Murkmire. The Rootmender was in fact the Soulless One, who arrived in Murkmire circa 2E 583. With the aid of two Hist-guided champions from the Naga-Kur and the Bright-Throat Tribe, as well as a Hist-blessed Imperial named Famia Mercius, the Soulless One traversed Eld Angavar and helped resurrect the Root-Whisper Tribe. The Circle of Champions subsequently began using the realm to host dangerous gladiator battles to the death. Fighters from all three sides of the Alliance War came to the Eld Angavar battleground to fight for the glory of the Fire Drakes, Pit Daemons, and Storm Lords arena teams. 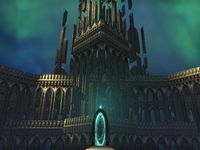 The Imperial town of Southpoint has a Colovian chapel known as the Cathedral of the Golden Path. 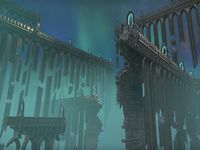 Whether the Golden Path nexus and the Golden Path cathedral are related is unknown. This page was last modified on 26 February 2019, at 22:35.